I enjoyed Sunbolt but was unprepared for just how much I loved Memories of Ash. Something else that caught me unprepared was the length: I was expecting it to be a novella, like its predecessor. The extra space gave the story a chance to delve more deeply into its themes, though it remained focussed. Elements of the plot that seemed like detours at first tied in to the main plot later down the track. Memories of Ash falls roughly into two sections. The first part is pure adventure. After Hitomi’s mentor is unjustly arrested and taken for trial, Hitomi faces a choice between staging a rescue or hiding from those working against her mentor. Either way, she must leave the mountain valley that has been her home for the last year. This is a story not content to stay in one place, moving from tropical port city in Sunbolt to alpine mountains, magic-blasted wastelands, desert dunes and city. I mentioned diversity in my review of Sunbolt. Memories of Ash applies that diversity to landscape, filling each one with lived-in detail. Khanani brings to life a world that stretches beyond the stereotypical faux-medieval-Europe tropes. She also brings the same variety to her monsters and magical races. Yes, there are werewolves–called lycans–but they’re not your typical half-wild, testosterone-pumped savages. Yes, there are vampires–two kinds, in fact. There’s also a phoenix, a tanuki and something like a kraken constructed of stone. Old favourites are given new twists. The second part of the book is more heist, as Hitomi attempts to rescue her mentor. The magic system particularly comes into its own in this section as Hitomi attempts to negotiate the wards keeping her mentor imprisoned. I found these cleverly imagined and particularly enjoyed Hitomi’s encounter with a certain key. However, the thing I loved most about the book was the motivations of the characters. In Sunbolt there were times where I wasn’t wholly convinced by Hitomi’s impulse to sacrifice herself for the sake of others, particularly in the cases where Hitomi hadn’t had much time to form a bond with the person for whom she was sacrificing herself. In Memories of Ash, it works. This is partly because she has more time to bond with other people, but mostly because she’s not the only one. Instead, a theme of honour plays out and characters must decide whether to act out of self-interest or to do what is right. This is a book where justice is held up as something worth fighting for and where the characters care about people other than themselves. Ultimately, I found it an uplifting read that manages to be both fun and to challenge current trends in fantasy. Highly recommended. 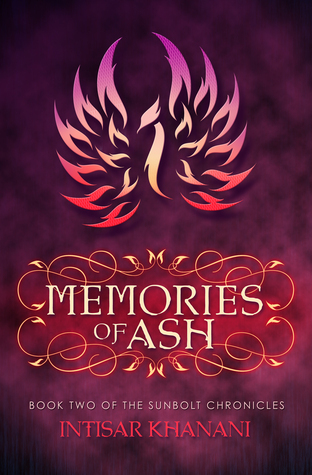 To celebrate the launch of Memories of Ash, Intisar is running a giveaway. Readers from the US can win a Kindle Fire, while readers from Australia and the rest of the world are eligible for a $50 (USD) gift card for Amazon or an online bookstore of your choice. Enter below. Honestly, I don’t mind if the next two books turn into epic monsters if they remain as well-written as Memories of Ash. I enjoyed the story hugely, so thank you for the review copy! I’m looking forward to the next ones. I am so so SO excited to read this book. I thought Sunbolt was terrific and have been lusting after the sequel for what feels like a very long time, so it’s awesome to hear that you liked it so much. I adored it and I hope you enjoy it just as much. I really must get around to these!! They are excellent, but I know that keeping Mt TBR under control can be quite a challenge.